To protect our species, we need to know they exist. Many species still remain undiscovered. In order to be able to protect these species, we first need to find them. One important road block to these new species discoveries is the species-centric focus seen in policy and scientists alike in sample permitting and research proposals. Another main impediment is the difficulty in obtaining permissions to access less explored areas, areas which likely harbor many novel species. Microbes are especially difficult to study in this current species-centric perspective. To study microbes, many researchers investigate the microbiome: the entire microbial community. When a permit, organization, or land owner asks what species you are planning to study, “all microbes” (across several kingdoms of life) is usually not an expected or appropriate answer from their species-centric perspective. This becomes even more evident in sampling, export, and import permits where specific species are usually part of the application or approval process. My experience with these types of permits have shown me how plant- and animal-species-focused the consensus perspective is. While working in Ecuador on my dissertation research, I filled out many sample-related forms. I was sampling soil and root microbial communities associated with certain plant species to investigate the microbiome (both beneficial and pathogenic microbes) of species native and naturalized to the Galapagos Archipelago. At each regional environmental ministry office, the issue of not being able to name the species I am collecting always came up. In this case, we usually ended up putting the plant species, but this wasn’t the species I would be sequencing. This species focus still does not accommodate microbial research very well. From the country or regional authorities’ perspective, they are not getting accurate information either. In both grant and permit applications, giving room to discover species and go a little outside of the specific species mentioned may increase our new species’ discoveries. In terms of proposals, it is becoming more acceptable to talk about microbiomes or ecosystems, but in all ecology fields, a species focus is present. If you don’t know the species exists, how will it be listed? Even if the entire community is the focus of the study, sampling is usually rather pre-determined, and a newly discovered organism, plant, animal or microbe, is out of scope. Routinely and explicitly giving some leeway in grants and permits to explore unexpected organisms would be very helpful in promoting discovery of new species. From a permitting perspective, these restrictions on sampling may actually be rooted in a desire to protect species, but may actually limit discovering new species to protect. A greater trust of scientists and their true desire to understand and conserve our natural heritage may go a long way in remedying this species-centric approval of studies. While applying for root import permits to the US, certain species’ roots were denied import, presumably on the grounds that they are invasive plant species. I study plant invasion, so I definitely empathize with the desire to keep invasive species out. Nonetheless, the purpose of my work is to study and better understand species’ invasion, ultimately to inform management and prevention of invasion. Increased leniency in these kinds of situations may be important to further our knowledge and protection of our species. More scientists in agencies that grant or deny requests for species’ movement may be helpful. Finally, the pressure to get research done and out the door keeps scientists in less challenging environments. In my field for example, this means that although research does occur around the world in very different ecosystems, the top studied systems are temperate regions, predominantly in Europe and North America. For both my Master’s and PhD research, I have worked at the San Francisco Biological Station in Zamora, Ecuador. The infrastructure of this station makes it much more accessible to do research in this tropical montane forest, but still, this type of work is very demanding (Fig. 1). Working in this location has been wonderful, but presents many challenges. For me, this first means finding the funding to be able to travel to and live in Ecuador, then Loja, then Zamora at the station. Next, the weather is extremely unpredictable, so much more time is planned for work here than, for example in the grasslands of Kansas, where I also do research and where my PhD is based (University of Kansas). And of course, the pretty extreme physical demands of working in this location. Nonetheless, this forest is without comparison to any I have seen, and harbors no one knows how many plants, animals, and microbes, working together to sustain this wonderful place. The more challenging locations have a high potential to harbor new species, or knowledge, to protect. Therefore, it is important to actively promote work in these locations. If we want to protect our species, we need to be able to openly explore challenging locations as equally as ‘easier’ locations, have more relevant policies on sampling and transporting samples, and rethink our ingrained focus on species. There is a growing interest in, for example, plant microbiomes, as well as less conventional research locations, but an effort to minimize the bureaucratic and mindset hurdles will help us find and learn about our species, ultimately to protect them. Fig 1. 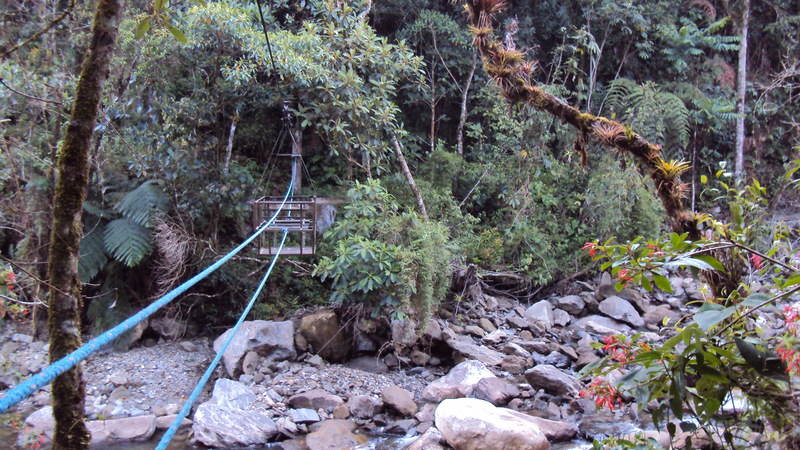 The pulley system to get across the Rio San Francisco to get to several of the Field sites of the San Francisco Biological Station in Zamora, Ecuador. Once across, the montane forest sites are several hours walking uphill.